It’s Tuesday and another warm day is at hand with a mix of clouds and sunshine. We’re starting the day with readings briefly in the 50s this morning but should pop to near 80° during the afternoon. The only issue is the clouds that will be filtering out the sunshine for awhile today. Humidity levels are still rather low but will gradually be coming up over the next 36 hours or so. A cold front is NW of KC that will gradually push into the region later tomorrow and tomorrow night…that will be the key to our storm risk locally. Thursday: Mostly cloudy and cooler with a few leftover showers possible, especially in the AM and later in the PM. Highs in the 50s. Here it is…April 16…we’re in the middle of the month…and once again, for the 2nd year in a row, the state of Oklahoma hasn’t seen a tornado yet to start the year. Unusual. This is the 2nd year in a row they’ve waited for a tornado…not that many are complaining. Last year the 1st tornado hit on 5/1. A record for the latest 1st tornado in a tornado prone state. The data above is through the 14th. There might have been a couple of additions yesterday. KS is also lacking as well as NE/IA. Something has has increased this year compared to last year is the number of people who have lost their lives from tornadoe. This year we’re now up to at least 27…last year (for the whole year) there were 10. I saw some interesting information yesterday that I wanted to pass along to you…and it concerns the dates when we have seen various SPC risks somewhere in the viewing area. Now this data includes the counties that are under the Pleasant Hill NWS coverage area that mostly is the same as our viewing area. Not totally but it does serve as a sort of rough outline of the frequency of the various severe risk categories in the area. 1st a step back…here is the coverage area from the Pleasant Hill NWS. Our viewing area isn’t as wide as areas into NE MO…also we add a few counties on the KS side west of the blue line…but this is a rough approximation of the viewing area. 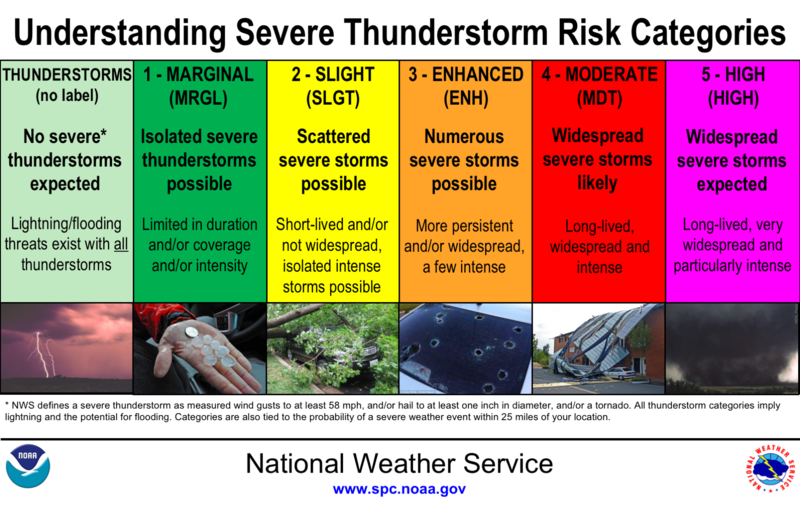 OK with that said…now let’s look at how the Storm Predication Center rates the risks of severe weather. The ones that I want you to pay more attention too are from #2 onwards. Not a fan of the added “marginal” category that added in a couple of years ago. So when I show you the risks over the last few years in a calendar format…from April to June…mainly pay attention to the SLIGHT category upwards. Most (certainly not all) of our severe weather in the Plains comes from April to June. May is the big month (usually) but June is also rather active locally in my opinion…moreso than April. The data that I’ll show you means that IF any part of a particular category above was in ANY part of the CWA that I showed you that is the responsibility of the NWS in Pleasant Hill…it was noted in the calendar. Whether it was only 10 miles of coverage or 100s of miles of coverage. All the same. This data is for the day of issuance from the SPC of the risk of severe weather. In other words it’s not for 24 hours away…or 48 hours away. It’s for the day of. OK so those are the ground rules of this…now the data. April>June of 2016-17-18. Again the data that I want you to pay the most attention to are all the NOT green colored dates. Enhanced and moderate days are certainly more noteworthy. Overall each of the last few springs have 7-10 “enhanced>moderate” category dates. So far this year…for the whole year this is the way things look. I don’t think a lot can be gotten from all this…but I thought it was interesting nonetheless if only because as you can see during the main Spring months…severe weather risks are present. One note about 2018…you can see how the cold April reduces the potential of stronger storms. The cold front will move through sometime towards the evening. The issue is whether or not the storms fire up ahead of the front..or behind the front and also when the storms actually form. After sunset and the the threat of severe weather is lower. Before sunset and the threat is somewhat higher. When the storms arrive in your local area is also important too. Later and potentially less intense…earlier and potentially stronger. The data last night is sort of all over the place because the models are trying to figure out when a rather stout cap above us will break. This is important because as long as the cap is in place stronger storms will have a tough time going. Some model data is maintaining the cap through most of the front’s passage time…that isn’t a favorable set-up for severe weather. My thought process at this point is areas from KC east and southeast will need to watch this especially after 7PM or so tomorrow night. My thoughts are that at least a few severe thunderstorm warnings will be issued locally for winds and hail potential of 60 MPH and/or 1″ (quarter sized). I don’t think this is a major outbreak and I think the threats of flooding and tornadoes are pretty low overall. Some areas will see over 1″ of rain though because of the storms (maybe more). Lets see how this data does…it’s the hi res NAM model. 1st map is a “future radar for 7PM Wednesday. So you sort of get the idea. I’ll make some additions if needed as the new data comes in later today. We continue to be in a “SLIGHT” risk for severe storms. Some of the morning data today isn’t overly impressive as far as the set-up goes…it does show storms but something still isn’t “right” about this set-up in my eyes at this point at least. Annette Keeter has the feature photo of the day again. She sent me some beautiful flower pictures. We are in Lane Kansas we watch fox 4 for our weather. Joe, can you please explain the 0Z time? The 7,9 and 11 PM models say valid on Thursday instead of Wednesday. I could use some education on that please! Thanks!